Despite rising food prices, New York City remains a haven for the cheap sandwich. 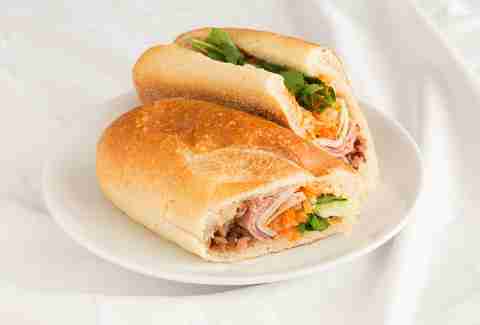 Sure, that chopped cheese sandwich from the bodega on your corner always does the trick, but there are so many other fantastic and affordable sandwiches to be had -- like the best bánh mì in the city for just $5.50, or a torta with a cult following for $8. Sometimes these sandwiches are lurking in plain sight, and other times you need to go out of your way for a truly memorable, inexpensive sandwich experience. 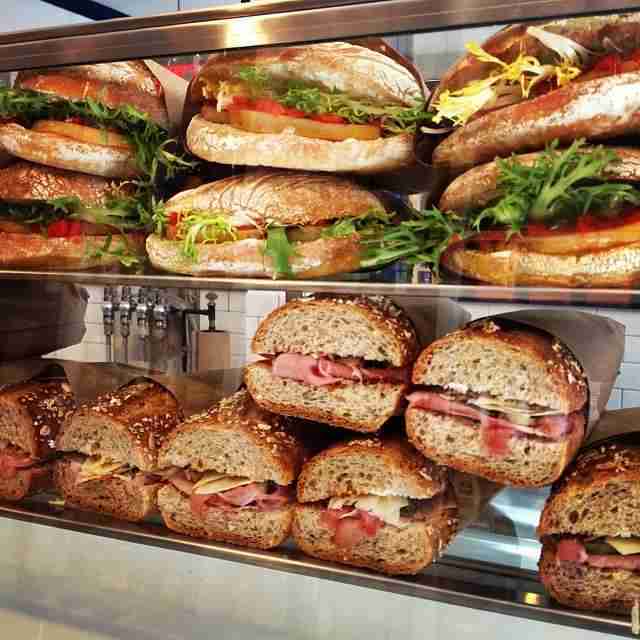 Luckily, we’ve got you covered with outstanding and diverse sandwich selections from across the boroughs. Taylor ham is a rare find outside of its New Jersey birthplace. Like scrapple in Pennsylvania or goetta in the Midwest, it’s a cultishly loved pork product that hasn't quite transcended its local roots. Court Street Grocers attempts to solve this dire underappreciation by showcasing Taylor ham in the most simple way possible: on a classic Martin’s potato roll with lightly scrambled eggs and American cheese. The porcine saltiness of the Taylor ham dominates, but the milder eggs and cheese rein the flavors in for a balanced bite. It may even make you a Taylor ham convert. Look no further for the best breakfast restaurant in the city. Josh Sobel, formerly of Court Street Grocers and Mile End, has a strong sandwich-making pedigree and with it he's created a stunning sandwich. 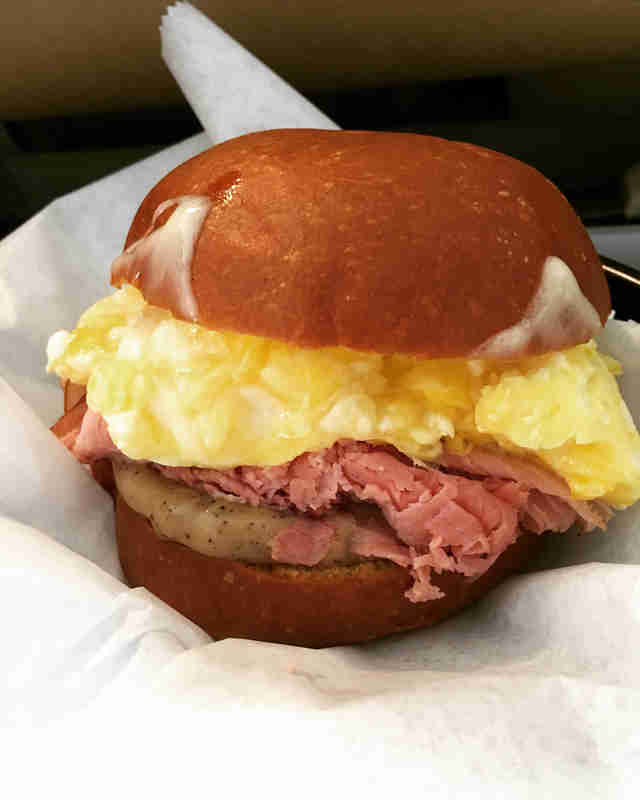 Sure, LA people love to post photos of Eggslut, the ludicrously long-lined breakfast sandwich spot that serves sandwiches on a distinctive brioche roll, but Sobel takes a similar roll and goes much, much further. His beautifully toasted roll is topped with a pile of slightly smoky ham, fluffy scrambled eggs, and cheese. Yes, this is very simple, but it's the "breakfast mayo," spiked with maple syrup and coffee grounds balanced by lightly pickled onions, that takes this sandwich to stratospheric heights. Best of all, for now at least, you won't have to wait an hour to grab the perfect breakfast sandwich. Ever been massively disappointed by an Arby’s roast beef sandwich? You see beautiful piles of roast beef and (sometimes) even Cheez Whiz and think, "this looks freaking delicious." Too bad the actual product is not even remotely edible. Thankfully, Roll-N-Roaster solves this problem. The roast beef is actually meaty and you even have the option of ordering it to your doneness (as in, preferably not gray). Covered in the finest Cheez Whiz and beef jus, it’s even better. Best of all it’s dirt cheap, so get two or three if you must and enjoy your sandwich amongst the classic '70s decor. All the sandwiches at this newly crowned classic sandwich shop on the Lower East Side are excellent, but it’s the "chicken," a generous piece of crunchy fried chicken on a biscuit, draped in gravy, and topped with red cabbage slaw, that’s the standout. It’s the sandwich every so-called "Southern restaurant" in NYC wishes it could nail, yet rarely does. No one makes baked salmon salad as good as Shelsky’s of Brooklyn, the neo-Jewish appetizing store in Cobble Hill. Although it contains hardly anything besides high-quality kippered salmon, mayo, sour cream, and seasonings. It’s so good that you should enjoy it with -- at most -- an everything bagel from Shelsky’s bagel purveyor, Mill Basin Bagel. A bagel this chewy doesn't need to be scooped or toasted, either. It’s had a years-long rivalry with Bánh Mì Saigon around the corner on Grand St, but I've always preferred the slighter storefront of Saigon Vietnamese Sandwich Deli on Broome St. Maybe it's the bread, the key component of a bánh mì, which is always shatteringly fresh. But it's most likely the fried pork bits and livery pate, or the freshness of the vegetables, like the mass of cilantro, pickled carrots, radish, cucumber, and jalapeño, which give the sandwich a depth of flavor that’s sometimes lacking at its competitor. Vegetarians rejoice! 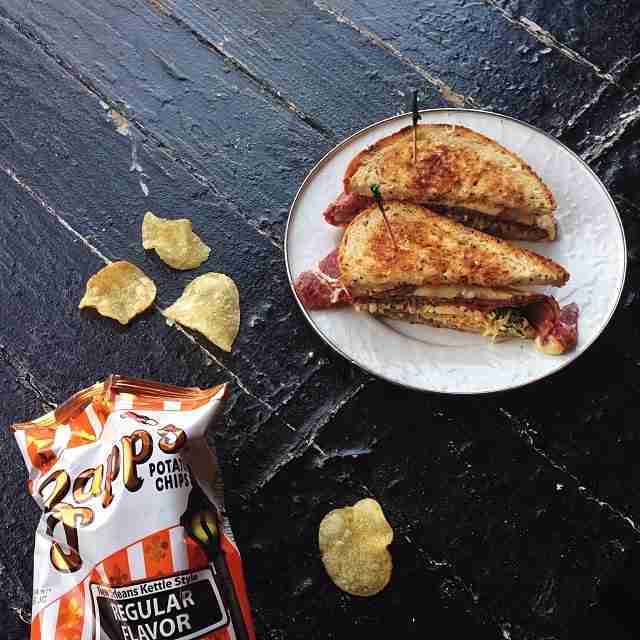 This is the ultimate version of a grilled cheese sandwich. While it looks nice enough, like a white bread sandwich you might have taken to lunch in elementary school, a whole world of spice and heat lurks underneath the mild, milky paneer cheese. Fiery peppers and sweet chutneys abound to cause a surprisingly complex bite. Make sure to have the kitchen griddle the bread to melt the cheese and enliven the chiles. What was once "Tortas Neza," the cultishly adored torta truck parked under the rumbling 7 train along Roosevelt Ave near Junction Blvs (and only a short walk from Citi Field) has been reborn a few blocks away in the front window of Juan Bar on Roosevelt and 97th St in Corona, Queens. The genius behind the torta sandwiches, each named for a different team in the Mexican football leagues, goes only by "Tortas." When the proprietor is named after the dish he serves, you know it's going to be good. The "Tortas Chivas" doesn’t disappoint. Piled high with a chorizo and egg omelet, plus a swipe of black beans, lettuce, shredded queso Oaxaca, pickled jalapeños, and tomatoes, it's a massive sandwich for only $8 and is far more than "just" a breakfast. La Morada does a bustling lunch business along a busy stretch of Mott Haven, a Mexican enclave in the Bronx. Its pambazo is, for good reason, the only knife-and-fork sandwich on this list. While I don't normally condone eating sandwiches this way, this sandwich is so good that sometimes exceptions must be made. First, a torta roll is filled with fried pucks of chorizo and potato, lettuce, queso Oaxaca, and beans. Then, the cook takes a ladle of mole (your choice of mole Oaxaca, which is a bit spicier, or mole poblano, fruitier and more bitter) and covers the whole sandwich, before finally finishing this monstrosity with a sprinkle of queso fresco. Eat this sandwich immediately and be glad that you did. 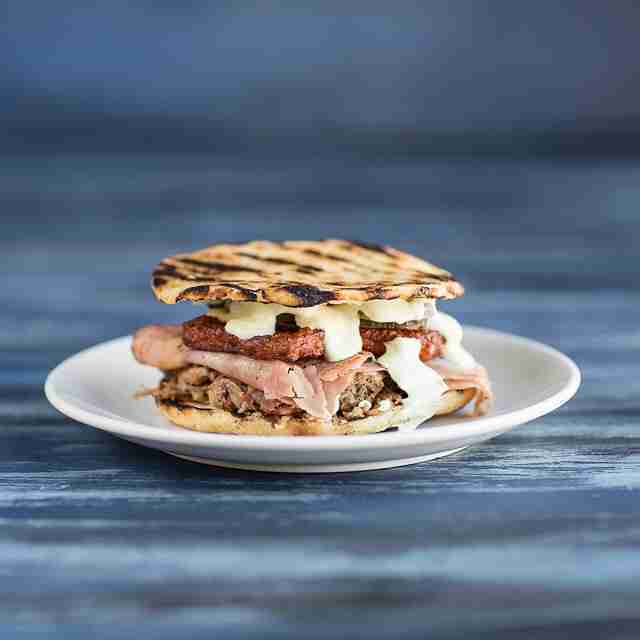 This Venezuelan sandwich shop with a location on Essex St on the Lower East Side built its reputation on the formidable "patacon" sandwich, which substitutes smashed, fried patties of plantain for bread. But it’s the "cachapa" sandwiches, made with griddled sweet corn pancakes, that are the must-order. Best of all is the cachapa de pabellon, a massive sandwich filled with black beans, shredded beef, sweet yellow plantains, and shredded queso blanco. It's salty, sweet, and filling all at once. At this Peruvian sandwich joint in Queens, make sure to order the chicharron sandwich, which mixes meat and starch for deliriously delicious results. Deep-fried chunks of pork shoulder rest on a bed of sweet potatoes and salsa criolla -- a bright, acidic onion relish -- that shines through the fatty shoulder bits. 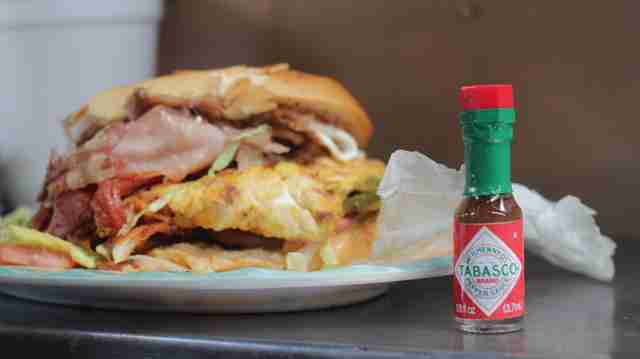 Better yet, make sure to add as much green sauce and mayo as you can handle, as this only makes the sandwich better. Two massive, rotating spits beckon as you enter this narrow Astoria shop right off the BQE. Your choices: chicken or pork gyro. Opt for the chicken, which takes better to the yogurt smack of tzatziki sauce that's generously applied to the bottom of the blistered pita bread. Topped with greens and tomatoes, it’s a hefty sandwich for well under $10. Trini eateries abound in the city, but for something truly outstanding, sometimes you’ve got to travel to a place in Ozone Park, Queens that blasts soca music, especially since a proper bake 'n' shark is a rare find in the city. Often, the bake -- a deep-fried disc that's sliced open and filled for sandwiches -- will taste like old, greasy oil. But at Trini Delite in Ozone Park, the bake is ultra fresh and the fillings are even better. A cutlet of shark is deep-fried and slid into the split-open bake and drizzled with habanero sauce, tamarind chutney, cucumber chutney, bright-green shado beni, and a cabbage slaw spiked with pineapple. 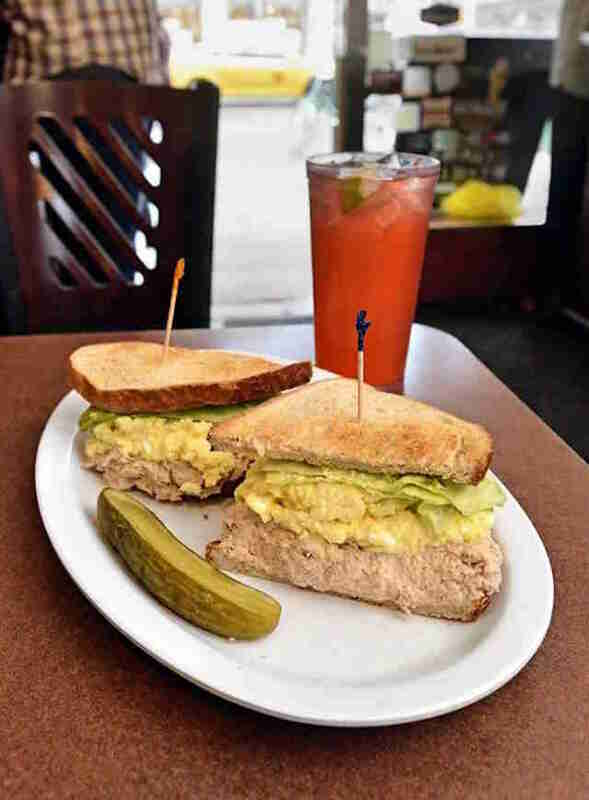 Sidle up to a stool at this classic Flatiron sandwich shop and get yourself a tuna melt on rye. The creamy tuna salad conspicuously lacks anything green or celery-like (well, except for a pickle on the plate). Get it topped with a piece of melted cheese and watch as the sandwich maker expertly griddles your rye to a burnished mahogany. Wash it down with a chocolate egg cream and nothing else will matter. The secret to great chicken salad is to keep it simple, and Peck's, which opened in Clinton Hill in 2013, takes this mantra to heart. Served simply on an onion roll with greens, the creamy chicken salad is seasoned and dotted with red onions and fronds of dill. Better yet, Peck's uses leftover rotisserie chicken for the salad, which adds a far deeper flavor than simply poaching chicken. This is the chicken salad sandwich of your dreams. Those of you who eat at Subway or settle for a bodega deli sandwich are doing it all wrong. If you want a real sub (at least as real as a Jersey-style sub gets) you need to go to one of the handful Jersey Mike's locations in NYC. Best of all is the club sub, filled with turkey, ham, bacon, and provolone. Order it Jersey-style or "Mike's Way" with oil, red wine vinegar, salt, pepper, oregano, onions, lettuce, and tomatoes. It’s a massive sandwich for under $10 that will surely satisfy any sub craving.